I've been using Super Squish pouches for a few months now. My son is now two, so we use them to take smoothies and slushies out with us. He loves the Super Squish packaging and will eat pretty much anything I present to him it. Brilliant for a little fussy eater! 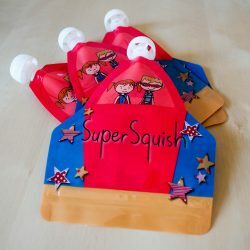 We love the Super Squish pouches! My children are now both well passed weaning, but we use them regularly for delicious home made smoothies. 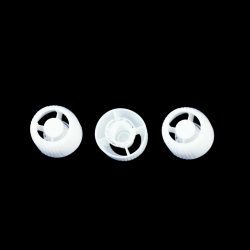 Easy to clean as well, just pop them in the dishwasher. Snacks and lunch boxes will not be boring! We love these! Already ordered a second set as a gift. I’ve been using these for picnics this summer for my 3 year old twins. Easy and fun and go down very well. Yoghurt works well and much less mess than taking a pot and spoon! Definitely recommend for out and about. I sent a very happy little boy off to school this morning with his rocket smoothie! Fabulous design, love that is isn't branded with the latest film and my little one is insisting he wants me to make a different smoothie for him everyday. Thank you so much from a very happy Mummy! Thank you Super Squish for saving the day after Kate decided nothing on a spoon was going past her lips!